If you’re looking for sun, sea, sailing and sand this summer Spain has more to offer than most after being awarded 511 Blue Flags, more than any other European Country. 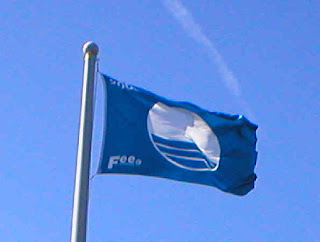 Puerto Calero on the Canary Island of Lanzarote or Grandes Playas in -Fuerteventura retain their prized Blue Flag Status. The Blue Flag Programme is owned and run by the independent non-profit organisation Foundation for Environmental Education (FEE). The eco label has been bestowed upon 3,550 beaches and marinas in 41 different countries across the world, with one in six going to Spain. The Blue Flag works towards sustainable development at beaches/marinas through strict criteria dealing with water quality, environmental education and information, environmental management, and safety and other services. In total 638 marinas have qualified for the award worldwide. The Canaries have 35 beaches and 3 marinas that qualify to fly the Blue Flags. Most of them are located in Lanzarote, -Fuerteventura and Gran Canaria. World Marine Guide list marinas on all the Canary Islands and the Balearics and have been awarded 63 flags for beaches and marinas. World Marine Guide also list marinas right around the Spanish coast. Why should you buy a property in Canary Islands?